Wanda Sue Larson. Photo courtesy of the Washington Post. The National Association of Social Workers (NASW) has asked a Washington Post reporter to correct or clarify an article on child abuse that mistakenly identifies the perpetrator as a social worker. 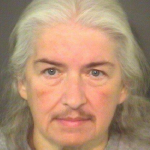 Union County North Carolina resident Wanda Sue Larson was arrested after a sheriff’s deputy found a foster child handcuffed to her front porch with a dead chicken hanging around his neck. The child was allegedly being punished for killing a chicken. Authorities soon discovered the foster child and adopted children at the residence were living in squalor. The foster child and his birth mother are now suing Larson, who was soon released from jail. Larson was identified as a social worker for Union County child protective services. However, NASW North Carolina Chapter Executive Director Kathy Boyd, MSW, ACSW, CMSW, said Larson is actually a nurse. Regulations allow North Carolina agencies to give the title of social workers even if they are not educated and licensed social workers. Boyd estimates about half of people identified as social workers in these agencies are not professional social workers. The chapter has been pushing for years to change this regulation without success. NASW emailed Washington Post reporter Lindsey Bever. UPDATE: The Washington Post agreed to remove the title of social worker from the article.